When a packet arrives to a network interface on the ASA firewall, the packet undergoes several security controls, such as ACL filtering, NAT, deep-packet inspection etc. After the packet passes all firewall controls, the security appliance needs to send the packet to its destination address. It therefore checks its routing table to determine the outgoing interface where the packet will be sent. 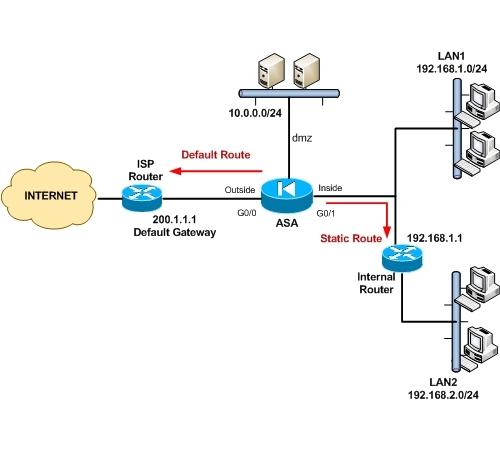 Cisco ASA firewalls support both static and dynamic routing. For dynamic routing, the ASA supports RIPv2, EIGRP and OSPF. I recommend not to use dynamic routing though and stick with just static routes. The reason is that one of the purposes of a firewall is to hide your internal trusted network addressing and topology. By configuring dynamic routing support, you might be advertising routes to untrusted networks thus exposing your network to threats. The scenario in the diagram above will help us understand how to configure static routing. The ASA connects to the internet on the outside and also has a DMZ and Internal zones. The default gateway towards the ISP is 200.1.1.1. The DMZ network is 10.0.0.0/24 and the internal LAN1 network is 192.168.1.0/24. LAN1 is directly connected to the Inside interface of the firewall. Additionally, there is another internal network, namely LAN2, with network 192.168.2.0/24. LAN2 is not directly connected to the firewall. Rather, there is an internal router with address 192.168.1.1 through which we can reach LAN2. Therefore, in order for the ASA to reach network LAN2, we need to configure a static route to tell the firewall that network 192.168.2.0/24 can be reached via 192.168.1.1. So we need to configure two static routes. One Default Static route for Internet access, and one internal static route to reach network LAN2. For directly connected networks (DMZ and LAN1) we don’t need to configure a static route since the firewall already knows about these networks as they are directly connected to its interfaces. I came across this article because I am having an issue doing what you have defined in your diagram. I have a layer 3 switch that has two VLANS on it. I need to be able to configure a static route on the asa so that when workstations or other network devices can access the VLAN. I am able to enter the route as you have shown and can ping from within the ASA to the vlan. But when a device on the network tries to access it, its still a no go. It seems that it is no passing packets back out the interface when they come in. Hello James, thanks for visiting. From what I understand, the inside interface of your ASA belongs to one VLAN, and then there is another VLAN on the switch, is that correct? If this is the case, you should create two Layer 3 Interfaces (SVI) on the switch using “Interface Vlan X” command and assign an IP address on the Vlan interfaces. This will configure your Layer 3 switch to work as a router separating the two internal networks. The gateways of the hosts should be the IP addresses of the Layer 3 interface Vlan on the switch. Please let me know if this clarifies your question. AN in order to route traffic from the ASA to the switch interfaces. The scenario I’m describing here assumes only one firewall internal zone, which is the “inside” interface. For this particular scenario you don’t need subinterfaces. What you mention would be true if we wanted two or more internal security zones, and thus we would have to configure subinterfaces on the ASA. My Network Diagram being like this I have one Adsl router it has been directly connected to ASA firewall e0 i assigned my public ip in e0 then i assigned local ip address in e1.e1 ip address is 192.168.2.1 subnet mask is 255.255.255.0 this line goes to connect to my server.my server ip address is 192.168.2.5 snm 255.255.255.0.
what is my question is? if we want to communicate with outside networks we should add the static route in ASA firewall,which ip i want to configure my adsl gateway is 192.168.1.254 or my isp router gateway? i hope i want to add the default route in my ASA firewall about my isp router gateway.If it’s wrong kindly send me the details. It depends if your ADSL router works in routed mode or bridge mode. If your ADSL router is not in bridged mode, then you need to configure a default route on the ASA which will be the internal IP address of your ADSL router. If your ADSL box is configured in bridged mode, then the default gateway on the ASA should be the ISP router gateway address. Thanks a lot BlogAdmin, using your example I did the next modifications and it worked fine. didn’t put an access list because the default one on DMZ interface was enough. With this I let all comunication from DMZ to LAN2 opened. I can’t get it to work from inside(172.18.0.0/16) to LAN2. I think it’s because when the packet returns from LAN2, as the internal router has an interface on inside the packet reaches the computer who started comunication directy and not through the ASA. In other words the return path is not the same as the starting path. Be careful with your DMZ. You said that you let all communication from DMZ to LAN2 open. This is not a good idea. If a host in your DMZ gets compromised from the Internet, then you also expose your internal LAN2 to danger. The attacker from DMZ can easily propagate into your LAN2 network. I suggest you to modify your DMZ access list and allow ONLY the required IP and protocols needed. Regarding your new problem, this happens because your inside zone hosts (172.18.0.0) have as default gateway the ASA inside IP. By default, the ASA does not allow traffic redirection in order for the initial packet from 172.18.0.0 to reach LAN2. If the ASA was a normal router, then the traffic would go to the ASA and then get redirected to your internal LAN2 router. This does not happen with the ASA by default. You can change this behavior though. The above will allow redirections to work. I have diiferent internal VLAN (port)configure on the same switch (one for the pc-lan, one for Server, …one for DMZ) some with the same security level but different network. 1-The switch port must be in trunk mode? 2-For multiple LAN2/24 (11), like Your diagram, there’s a unique route or different to set? 3- i’m tryng to configure Active/Standby statefull failover with 2 ASA, on two different place in my network, I would use sub-interface on two different switch, doYou think it’s possible? 4-I’m not able to find a rich detailed manual, could You help me? I’ve two vlans(100,101)connected to an cisco 2950 switch and the switch connects to the inside interface(ethernet 0/2) of the asa. I want to enable inter-vlan routing and want to access internet. I assume that I’ve to configure a trunk between the asa and 2950 switch(inside). My problem is when I try to configure sub-interfaces on the asa interface(ethernet 0/2) it wont allow me to do so. Further it wont allow me to configure (nameif,security-level and ip address)on the physical interface. Every time I’ve to configure interface vlans and has to map them to the physical interface. Can anyone assist me with this request. From your description I have understood that you have a Cisco ASA 5505 model, is that correct? If that is the case, then you CAN NOT create subinterfaces on the physical interface if you have the base license on the ASA. For Cisco ASA 5505, all physical interfaces are Layer2 ports, and you must create a Layer 3 interface Vlan which is mapped to a specific Layer2 Vlan configured on the physical interface. With the 5505 base license you can create up to 3 Vlans, but two of them can not communicate between each other. If you create for example two inside vlans (inside1, inside2) and one outside vlan, then inside1 and inside2 can only communicate with the outside, but not between each other. I have the same configuration : several internal VLANs with a layer 3 internal switch and ASA for outgoing connexions. The ASA has only one internal IP in VLAN1 (and is connected to a VLAN1 port on the Layer 3 switch). The internal switch is the default gateway for machines in other VLANs. I couldn’t get the ASA to route connexions from VLAN1 to the others, I assume this is because it doesn’t see the return packets (packets form other VLANs to VLAN1 are routed directly through the internal switch). I attributed to the internal switch an IP for each VLAN. And a default route to go to the ASA. Then I set all my machines to use the internal switch as their default gateway, even for machines in VLAN1. That way traffic between internal VLANs doesn’t go through the ASA anymore. Hello daff42, thank you for your comment. Yes you are right. The way you have configured the switch, all the Intervlan routing goes through the switch and never reaches the ASA. Ofcourse, internet traffic will have to go through the ASA via the default route that you have on the switch. I have a similiar configuration as daff42 w/ minor differences. B.) ASA 5550 firewall used for external connections. 1.) Give the ASA an IP in each internal VLAN (though the L3 switch will still be the gateway). This way the routing table will auto populate with these networks. This requires more cabling and use of ports on the ASA. I only have 8 10/100/1000 ethernet ports. 2.) Create a new subnet just between the L3 switch and ASA (say 10.0.0.x) and then create static routes for each internal vlan. Will this make my NAT rules more complicated? I guess what I mean for quest # 2 is, will I have any problems creating network objects in ASDM (gui) for networks that are not directly attached or will I have to do some complicated NAT? As I said before, one of the internal vlans will provide http/https services. For option 1): You can remove all layer 3 functionality on the switch (i.e remove all SVI interfaces) and configure a SINGLE trunk port from the switch to one interface of the ASA (lets say gigabitethernet0/1). Then, on the ASA interface gig0/1 you can configure 4 subinterfaces (one for each internal vlan) and assign IP address on the ASA subinterfaces (e.g gig0/1.1, gig0/1.2, gig0/1.3 etc). All machines in each vlan will have as default gateway the IP address of the respective ASA subinterface. For option 2): Leave all layer 3 functionality on the switch (SVI interfaces) and then configure another vlan connecting the switch with one internal interface of the ASA (e.g subnet 10.0.0.x – just as you suggest also). Then you have to configure one default route on the switch: ip route 0.0.0.0 0.0.0.0 10.0.0.1 (assume ASA internal IP is 10.0.0.1). For this option, you will NOT have any problems on the ASA by configuring object groups for networks that are not directly connected on the ASA. e.g if one internal vlan has subnet 10.1.1.x, then you can configure a network object on the ASA for network range 10.1.1.x with no problems. Then you can do NAT on the ASA for that network as normally you would do for a directly attached subnet. I will be using option 2 and keep the 3750 switch as a layer 3 device. I’ve got the setup as shown in the picture, but I need to allow hosts from LAN1 to communicate with units on LAN2. Hosts on LAN1 has ASA as default gateway. Is this an ASA issue or how do I solve this task ? The ASA can not do icmp redirect. This means that traffic from LAN1 when is reaching the interface of ASA, it is then dropped because the ASA does not send the traffic back to LAN2. You must set as default gateway for LAN1 the interface of router (192.168.1.1) and then configure a default route on router pointing to the ASA internal interface. This way you will be able to reach LAN2 from LAN1 and also you will be able to access the internet as well. Here’s my issue. I’ve got the exact setup you’ve got there. I’ve got lan 1 192.168.200.0/24 and lan 2 192.168.210.0/24. They are connected with point to point bonded T1’s with routers at both sites to route the traffic between the 2 sites. Both sites have their own internet connection. I’ve got the ASA’s with a 0.0.0.0 route to the internet gateway and a static route for 192.168.210.0 255.255.255.0 192.168.200.2 (router) on Site1’s ASA, and 192.168.200.0 255.255.255.0 192.168.210.2(site 2’s router) on Site2’s ASA. I cannot connect pc’s or VOIP phones across to the other site from either direction. Both sites could connect to the internet. 1. Configure a default route on each site’s router pointing to the internal IP of ASA. 2. Configure also static routes on the routers to reach the other site’s LAN network. 3. The default gateway on user’s PCs and IP phones should be the site’s router. This means that all traffic routing will be handled by the routers and not the ASA. I have a cisco router, one interface pointing the isp and the other pointing the ISA. the other interface of the ISA is pointing to my switch catalyst 3750. i have vlans(5) configured on the switch, the problem that is that i cannot ping the interface facing the router. but from the ouside interface of the ISA i can ping my LAN but when iam in my LAN i cannot ping the outside interface of the ISA. please assist i just bought this ISA5510. sorry but I did not understand your problem exactly. When you say ISA do you mean the Cisco ASA firewall or the ISA server of Microsoft? This blog is great and I’ve almost got my issue solved. I have the same scenerio for a customer and I had added the ip route like you initially discussed. However, I cannot ping the router from the ASA. It’s an ASA5505 going to a linksys router (I know, I know). The routing table in the Linksys is correct and has a static route back to 192.168.1.0/24 for WAN and internet access and I can ping anything on the .1 network from the .2. I see the post saying I need to make the default gateway for the .1 network the IP address of the router. Shouldn’t I be able to ping the router from the ASA from adding the initial route to it? Anyhow, I believe the WAN interface of your Linksys is blocking icmp traffic, thats why you can not ping it from the ASA. Also, usually SOHO routers (like Linksys) are configured to use NAT by default, so you can not actually go from the WAN to the internal network (i.e you will not be able to access network 192.168.2.0 from the 1.0 network if the linksys is doing NAT). I need a little help also. I have 2 buildings with multiple IP networks (B1 – 192.168.1.x,192.168.10.x,192.168.2.x and B2 – 172.30.10.x, 172.30.1.x). They both have ASA 5505’s. I have a network connection between the two buildings now and need to allow both networks to see and interact with each other. Would I set up something like the DMZ example above or is there an easier/better way for this to work? To further clarify, both will need to access the internet at their own locations, just network traffic needs to travel across the proposed DMZ (or other solution). The DMZ as shown on the picture above is just for illustrative purposes only. In your case you don’t need a DMZ for your scenario. I assume that you have a dedicated router on each site for connecting the two building together? If yes, then the scenario is exactly as the picture above. All PCs in building A should have as default gateway the router which should have a default route towards the local ASA 5505. I would like to do a static NAT on a server inside my LAN. I was able to do NAVT on a server in my DMZ. like to be able to telnet to port 443 with real IP. You do not need any static routing on the outside router since the internal server will be translated into a public IP. You must allow also the proper entries in an access control list applied on the outside interface. I’m in process of segmenting critical servers from user workstations. I need to add segment network 192.168.2.0/24 where the “PCI” servers must be places. This PCI network is the highest security level, however all workstations in both existing networks must be able to communicate with the servers within the PCI network. Currently, the 192.168.2.0 network can ping both networks and has internet access. However, no services such as printing, DHCP, or Applications are working. Any assistance is much appreciated. You are asking for a whole network design with PCI from a blog post without giving too much detail. As you understand this is difficult to do. As a general guideline, you will need to put the PCI servers in a separate ASA 5510 DMZ (separate physical interface) and use the proper NAT and access-lists on the ASA to control traffic flow. My provider gave me a VLAN with number 2XXX. i created subinterfaces on my 1841 router and with dot1q it works fine. now i want to replace router by ASA5505 with advipk9sekbundle license, but cant create subinterfaces on Ethernet ports. Though i created Vlan2XXX and assigned it to Ethernet 0/X and put it into trunk mode, still it doesnt work. any suggestions? Try the above and let us know. I figured out that switchport was not working, so i put it into trunk mode. now it works fine. By the way: is there any chance that i configure failover or ISP redundancy on single ASA5505? For example ISP#1 on interface Eth0/0 and ISP#2 on Eth0/1. if one fails other must become route to 0.0.0.0 0.0.0.0 <<any chance of that? I have two network in the same interface, but the second one is behind a router, so I set a static route on ASA and some access-list permitting all traffic. When I try ping one host on the lan1 from the lan 2 it’s doesn’t work. Can anybody give me a tip? be more specific. Can you give us more details? Hi BlogAdmin, thanks for answer! I have a topology like yours, put on the top, so i want that communication among those lan (A and B) pass through ASA. The communication between those lan, without pass through ASA already occur. My problem begin when i try to use ASA as a router. I can ping both networks from the ASA. I insert access-list to permit any traffic from and to both networks, but it don’t work yet. When you create two lans (security zones) on a Cisco ASA firewall, you need both an access-list and a “translation rule” between them in order to communicate. So, just an access-list is not enough. You need to see which security zone has the highest security level and configure a proper NAT rule between the two Lan networks. I have very little experience with networking and few resources to contact but am trying to learn how to set up 2 subnets using static routing. We have a ASA 5505. My network is similar to above (right hand side of ASA) where I have 2 LAN’s on different subnets (192.168.1.32/27 & 192.168.1.64/27) going into the ASA and need to be able communicate between machines. I am currently unable to ping between machines (i.e. 192.168.1.36 -> 192.168.1.70), but can ping all from ASA without issue. I have been trying to set up Static Routing but because I really don’t know what I am doing, I haven’t been able to make it work yet. Thanks in advance for comments/help. Configure all machines with default gateway being the IP address of router on each segment. Then configure a default route on router pointing to the inside interface of ASA. I have tried quite a few things, but at a loss. I am sure the answer is too easy, but my head is too far wrapped around the problem. Thank you for any assistance you can advise. Thank you. If the inside network is assigned public routable IP addresses, then the simplest thing to do is to disable NAT using “no nat-control”. This means that your ASA firewall will be working as a normal router with all firewall security still in place. Any inbound access (i.e from outside internet towards your internal network) will be controlled by an access control list that you will have to apply on the outside interface. I have the same topology, I’ve got Lan2 is 172.16.2.0/24, webserver is 172.16.2.2 (gateway: 172.16.2.1, on switch layer3). The machines in the array that are appointed to the Default gateway 192.168.0.253 ASA Can not access the machines from Branch. I can not change the Default Gateway for the router to his speed and 10 Mbps. How do I allow the ASA, that all machines of the four networks to communicate? What commands do I use to do NAT? I have a similar scenario and would appreciate your help. My DMZ (192.168.10.0/24, VLAN 10) and LAN (192.168.1.0/24, VLAN 1) are connected to ASA through 3COM 4200 switch, where I set ASA DMZ interface IP to 192.168.10.254, and ASA LAN interface to 192.168.1.254. I manage to ping ASA LAN interface from my workstation, which is in VLAN 1, default gateway 192.168.1.1. The problem is that I cannot ping 192.168.10.254 from the same workstation. IP routing is enabled on the switch. What static routes do I need on ASA? Thanks for the reply, but I need another way. There is no other way to solve this problem? I can not change the Default gateway of the PC LAN ASA 192.168.0.253 (100 Mbps) to the router 192.168.0.254 (10 Mbps). If I do that causes a slow network. I can not do so, I need another solution. As I explained on the post, if the networks are directly connected on the ASA, then you don’t need to configure a static route for them since the ASA device already knows about these network. Your mistake is that the default gateway for your workstation is 192.168.1.1 instead of 192.168.1.254. I can ping from LAN1 (10.1.95.0) to computers on LAN2; and LAN 1 to DMZ with static identity NAT. But I can not connect from computers on Lan2 (10.1.10.0 and 10.1.11.0 to DMZ (172.16.2.0). Did computes in LAN 2 and Lan 1 suppose able to connect to DMZ (security at 50) by default? I have tried disable/enable the “nat-controll “, it would not help. What do I need to add to allow computers on Lan 2 talks to servers on DMZ? But I can not ping or connect to any computers on subnets on lan2. Do I have to add this same access list for each of subnets on lan 2? Or it has other easy way to accomplish this. For your first question, you need to create some sort of NAT (either PAT, or identity NAT) for your LAN2 networks in order to be able to access the DMZ. Just like you created an Identity NAT for LAN1, you can do the same with LAN2 networks (create identity NAT between inside–>DMZ but use the subnets of 10.1.10.0 and 10.1.11.0). For the second question, yes you add the subnets of lan2 to the same access lists as you did for lan1 and dmz subnets. Openvpn is running on address 192.168.0.3. The openvpn server has an IP of 192.168.20.1 and is allocating addresses to VPN clients in the 192.168.20.0/255.255.255.0 address range. All hosts on the VPN server LAN (192.168.0.1 – 192.168.0.254) need to be visible to the VPN clients. I have port forwarding working fine and I can connect to the openvpn server running on 192.168.0.3, and get an address of 192.168.20.2. I can ping 192.168.0.3 and 192.168.20.1 (same physical machine) from a VPN client. However I can’t ping any of the other machines on the network. One thing I tried that had some effect was creating a persistent route on 192.168.0.10 to the openvpn server (route -p add 192.168.20.0 mask 255.255.255.0 192.168.0.2). This let me ping the openvpn server’s 192.168.20.1 address but not the vpn client on 192.168.20.2. Since this was a previously working openvpn configuration I’m pretty sure there’s something I need to do on the ASA but I can’t figure it out. Sorry but you confused me. At the beginning you say that openvpn server is 192.168.0.3 and then below that “The openvpn server has an IP of 192.168.20.1”. Please clarify again the network topology and the problem. I didn’t get it. Hi, thanks for the reply and sorry about the confusion. The openvpn server on the local network is at address 192.168.0.3. The openvpn server gives out addresses to VPN clients in the 192.168.20.0/24 range. To the VPN clients, its address is 192.168.20.1. I guess you could say the openvpn server is like a router that has an external address of 192.168.0.3 and an internal address of 192.168.20.1. What is the default gateway IP for the hosts at 192.168.0.0/24 network? Try the following: Configure a host (lets say 192.168.0.10) with default gateway to be the IP of the vpnserver (192.168.0.3). Then try with a vpn client to reach the host 192.168.0.10. Is it possible to use an Cisco ASA5505(security plus licence) with L2 TPLink switch(support 802.1Q)for intervlan routing (ASA on stick)and Internet access. I want to configure several VLANs on switch, make trunk port on switch and connect to trunk port of asa5505. For each VLAN I will make VLAN interface on asa which will be default gateway for hosts in VLANs. Also, I plan to connect asa to Internet from one port which will be in separate VLAN and two asa`s port for servers in DMZ(separate VLAN). Have you seen this configuration somewhere, is this possible? I have not seen this exact configuration in a real network but it should work with no problems. For the ASA5505 (security plus license) you can have one physical port configured as trunk port and then you must configure layer3 vlan interfaces on the ASA with IP address, security levels etc. This is it what I try to accomplish. I am working with higher ASA models and I know their capabilities but I have never work with 5505, i have read conf guide 8.4 and it seems that is possible but i have to be sure because i have to know which hardware to buy. Thank you for help and example configuration. I have an ASA5505 which I know has some restrictions in the base license. I’m not 100% sure though if my problem is caused by that or something else. I have setup the DMZ and due to the license restrictions have set it so that it cannot initiate connections to the inside interface. However, should machines on the inside interface (security 100) be able to connect to machines in the dmz (security 50) or is that restricted by the license? Communication from inside to DMZ should be working with no problems if you set up the proper nat and access-lists. So if you have a web server sitting in the dmz, then hosts from your inside network should be able to access the web server even with the base license. I have existing PCS1 network with ip 172.31.34.0/255.255.255.0 tie-in to DLAN 172.18.120.0/255.255.255.0 with router interface 172.18.120.254 as gateway. I would like to tie in this new network into existing one. I have Cisco ASA 5510 in between router at the existing network and PCS2. but can’t go through either ip inside to outside vice-verse. please advice any configuration to make it work? Have you configured the required NAT and ACLs? Inside#1 has seclvl 100, Inside#2 has seclvl 90, DMZ has seclvl 50 and Outside has seclvl 0 ofcourse. On my DMZ i have a backupserver that get’s backups from some clients on the outside, and i now want to get it to do backups from my Inside#’s too. I can connect to it, but it wont send any files over it. It’s tries to do passive mode and just hangs there..
What protocol are you using for the backup service? Is it just FTP? Do you have the proper NAT translation between the DMZ and Inside zones? Please give me more information so that I can help. Hi, I have got the same setup as indicated in the illustration above. I could ping Lan2 from Lan1 but failed remote desktop connection to Lan2. Could it be the firewall rules on ASA? Please advise. Thank you. What is the default gateway of the hosts on Lan1? Is it the inside address of firewall? For testing, change the default gateway of one of your hosts on Lan1 and make it to be the router interface. Then try to access remote desktop on Lan2. If it works, then the problem is that the firewall can not redirect traffic from Lan1 back to Lan2. The default gateway is ASA,it is inside address of the ASA firewall. Yes, I did that and it worked by changing the default gateway to Lan2 router. When the default gateway is ASA, I could not ping Lan2 but after ‘same-security-traffic permit intra-interface’ is enabled on ASA, I could ping Lan2 but not remote desktop connection. It will not work for RDP (or for any other TCP/UDP protocol). The ASA can not redirect the RDP traffic back to the Lan2 router. Could advise me how to route the traffic from Lan1 to Lan2 in this case? Thank you in advance. We have two independent networks (each supported by two 6509 cores one a the gateway for all odd vlans and the other a gateway for all even vlans) which we expect to link via four ASA5510s, two for each network, set up in what we hope will be redundant mode cross-connected through two 3750-12S switches (fiber). There will be two additional ASA5510s cross-connected to these switches (again redundant) that will create a DMZ for another series of servers/workstations. Finally, this DMZ will be linked to a “wild” network via a PIX firewall. Data must travel between the two independent networks. Additional data will need to travel from either independent network to the servers in the DMZ. We need to control access from “wild” to DMZ and from DMZ to the two networks. The two inside networks will NEVER be allowed to connect to the “wild” and visa versa. Does this seem like a workable architecture? Is it overly complicated? We cannot tolerate a single point failure that blocks data flow. How will the firewalls respond to hardware failures (loss of route) in a dual connected system? Can they handle the route changes dynamically or do each need the full static route list to handle switchover? Any recommendations on route/gateway setup would be appreciated. I can supply a more detailed visio of the network if required. Thanks for the reply. I can’t seem to paste a copy of the diagram into this blog space. Any suggestions on how I can get the diagram to you for review? The backup software uses ie. port 2456 as a “hanshake” and i get the confirmation that it’s connected and all i ok, then the transfer of files itself goes on port “1024-2048”. So the “command port” is 2456″ and “data port range is 1024-2048. It seems that the problem is that the backup traffic does not use fixed port numbers. This is very bad for a stateful firewall, which blocks such traffic. This is like the FTP which starts a handshake connection on port 21 and then data is being sent on port 20. ASA has a special “inspect ftp” command to fix that problem with FTP service. However, in your case the backup protocol you use maybe is not supported in ASA application inspection. What you can do is open up ports on the Access lists from 1024 up to 2048 and also open up port 2456. These are a lot of ports to have open but it maybe the only solution. We have an ASA5520 that has multiple sub interfaces. On the one subinterface I have two devices. The one needs to FTP to the other. It opens the connection, but when the FTP server tries to respond, it is sending it to the ASA instead of straight to the FTP client which the ASA then drops (deny tcp (no connection)). Any ideas as to why this would happen? It’s supposed to just talk directly to the client. The only thing I can think of is that the ASA is giving the wrong ARP response. Giving it’s own IP address instead of the client’s address when getting an ARP query? Does this sound correct? If the two devices that you mention are sitting on the same vlan and same layer3 subnet, they are not supposed to send any traffic to the ASA when they communicate between them. The ARP assumption that you say is not valid unless there is a serious malfunction on the ASA which I don’t think it happens. I have confirmed it again, the firewall gives it’s own mac address as an arp response for the server on the same vlan. If I force a static arp address on the server, everything works as expected. Unofortunately this entry doesn’t survive a reboot and gives me unexpected results from time to time. Ok, I think I have fixed it. Proxyarp is apparantly turned on by default under certain circumstances on some interfaces. It is possible to saftely remove this if you do not hit one of the restrictions. Hi, I just wanted to say thanks. I had some router work done by a consultant and I figured I needed to set up a static route on my ASA afterwards, but I wasn’t totally sure. With your explanation and example I was able to get it right on the first try. Hello. Sorry for my English (I’m from Russia). I have configuration with 1 VLAN and 2 LANs. LAN1 Network is connected to ASA 5505 directly by switch. LAN2 is connected with MPLS with router wich is connected to the same switch. There is no VLAN configurations on the swich. All other devices are connected to the same switch. MPLS router have the address in the same VLAN1. If it nessesary I can send diagram of the network. I have made configuration like you (add static route to LAN2 via MPLS Router) with default setting of inspect traffic. So ICMP is working beetwen host in LAN1 and LAN2, but any other traffic don’t work. I can send configuration of my ASA and of MPLS Router. If I use LynkSys RV082 instead ASA 5505 it works fine, if I use ASA I have a problem with another traffic. I have configured my ASA 5520 V7…and everything is working properly but:: from the Inside or internal network, i can access the dmz server running the www and email. I have tried all (little)i know, and i shoul admit im very knew to this industry though i love it. bellow is the sh run of my asa. Can anyone please try to figure out for me why i cant access or even ping from inside to the dmz? as our internal pcs wont be able to access the www plus mail servers? and where is the show run? Im really sorry for that mistake..
Guys,on the other side i should honestly admit that im quiet new to the cisco asa industry, but willing to new adventure about these machine. Please any single, simple (but big) help from you….will really be highly and fully appretiated..
Once again i thank you in advance all you guys. Do the change above and Let me know how it goes. First of pls do allow me to thank you so much for your time and cooperation…. However just to clarify according to the above command you gave me…so should i remove the previous one?i mean the static nat which is there!! I have done accordingly as per your advice…. But still. no ping or access from the inside zone to the dmz. Basically for the dmz interface, the E0/2 connects directly to a switch (normal switch) and from this switch is where the 172.16.16.80 www and 172.16.17.25 email servers are. If you need access only from inside to dmz, you can configure PAT from inside to dmz interface. And according to my router theres nothing that could stop or block any acces right. My appology for not being able to give you the feedback of your last reply to my quations coz i´ve been out for work to a place with no internet accesas. my problem was that my internal PCs cannot reach my dmz. Last reply of you, you said i should remove this static :static (inside,dmz) 10.1.4.0 10.1.4.0 netmask 255.255.252.0 coz when i past it, it still didnt work. and when i past this; nat (inside) 2 10.1.4.0 255.255.252.0 it said duplicated entry….result my internal PCs still cannot access my server on dmz. Dear BlogAdmin….im really so disparated and sorry for that. so any other help please? by the way i have pasted my updated ASA sh run so you can have a better idea. access-list nonat extended permit ip 10.1.4.0 255.255.255.0 172.16.16.0 255.255. I have procceede accordingly exactly as you said…. How do i remove the above commands pls… i need the internet back or to bring back everything as before pls. And as for my issue…any other clear idea why im not accessing my dmz from the inside network?? OK, you have sent me so many configurations that you got me confused. I did accordingly to your above statement, and everything is back to normal, i mean the inside network now can access internet back, and thank you so much for your precious time and cooperation for being there as great IT professional, and as well for sharing your vision….i thank you Sir. So by the way, the internal network still cannot reach my dmz. Anyone can help according to the ASA 5520 v7 sh run please? As you may know im stil struggling in getting my inside network to access or communicate to my dmz . As i got another ASA5520 for my test, so i have configured the other asa, and according to this configuration bellow, i have installed a the EASYphp web server on the Server with 172.16.16.80 the wwww on the dmz. so now, from the inside network i can access that page, but i got dont get successfull ping like for instence at the same server with 172.16.16.80 even though i can access the web server on it through the easy php applic. However, my concern is……does it really means that my inside network is communicating with the dmx now? How do i enable reall ping?? is there any command to enable ping? Dear BlogAdmin, according to my config bellow, can you recheck it for me if i have missed anything else. Why im not getting succeessfull ping to dmz?but it can open the web server i have installed on server on the dmz? why im not getting internet on the dmz? can you pls help? What other real test i should make to make sure im reaching my dmz? since right now i dont have yet the www and smtp email server running? Dear BlogAdmin, i should always thank you so much for your time and cooperation, and remember that ant single help from you will be highly appretiated. If you access the web server from inside, it means that the inside communicated with dmz just fine. Pinging is not a reliable way to say if you have communication or not. Accessing real services (such as HTTP) is what proves that you actually have proper communication. To allow ping you must allow icmp echo-reply on the dmz_int access-list. Also, to allow internet access from the dmz, you must allow DNS udp 53 on the dmz_int access list as well. Well im really sorry for my insistence or for being so hard to understand you. but one thing is for sure, since i started writting you, i´ve been improving my skill as far as asa appliance is concern. Well as i said before and as you know i was having a problem with my internal users who couldnot access my dmz zone…but now with the above sh run config (still the latest) it seem i can reach my dmz zone specifically to the server with ip 172.16.16.80 for www, as i have installed in this server a EASY PHP WEBSERVER..and from the inside pc or network (10.1.4.x) i can access that webserver through the browser 172.16.16.80:8080 and it open that web server. On the Other side…..from the outside, or internet i tried to reach that server on dmz through its private or translated ip address, so through the browser i type (41.223.156.106:8080)or even without the 8080…but i couldnt reach that webpage on the server on dmz. Dear Admin….pls forive as im still to young and just learning about the security appliance…..remember your help could be so vital and could make such a big impact. I thank you in advanced. If I have a VLAN192 that has 192.168.0.x /24 what static nat and access list would I have to setup on the ASA to expose a web server? Basically the Vlan192 is managed by the layer3 switch and the ASA does not have an interface directly connected to it. The traffic has to go through the switch. I managed to get the VLAN192 to reach the internet by doing nat on the IPs, but I can’t get an external IP address on the ASA to map to an internal IP address on the VLAN192 and pass traffic through the ASA. To achieve that you need to configure static NAT on ASA between “inside” and “outside” even if vlan192 is not directly connected on the ASA. Since traffic from vlan192 will reach the “inside” interface of ASA, it will be statically NATed to outside interface. This is the only way to expose an inside host to the outside world (if you are using NAT). I need to connect e branch office through 2 switch layer 3 (one in the head office and one in branch office). I’m not be able to reach the head office network, I can ping ASA and head office switch layer 3 interface but the PC don’t answer. from ASA CLI I can ping branch office network. This is a problem I had encountered in the past as well. It is because the default gateway of the PCs in head office is the ASA internal IP. So when you ping a PC in head office from the branch office, the ICMP REPLY packets from the PC goes to ASA internal interface. The ASA does not allow redirection of traffic back out its same interface by default. One way to mitigate this is to configure the PCs in head office to have as default gateway the L3 switch (192.168.100.249) and then configure a default route on the L3 switch to point to the ASA inside IP. So the PCs will have both internet access and also able to reach the branch hosts as well. but if I understand well the command: same-security-traffic permit intra-interface shoud be allow the traffic in and out on the same interface? or not? Yes that’s correct, but I haven’t tried it to tell you for sure if it will work. Give it a shot and let me know. Thank you for your time. I have a Cisco 5510 and my goal is to route specific traffic from the internet to specific web servers on the inside interface while employing VLAN tags. The traffic will be coming in on an IPsec tunnel from a non-Cisco device. Thus due to compatibility issues, I want to route the tunnel through the ASA (punch a hole) into a VLAN to get to its ultimate endpoint on a web server where the IPsec tunnel will end. I want the IPsec tunnel to pass through the ASA. The ASA doesn’t seem to play nice with IPsec between a non-Cisco and Cisco product. My thinking is that if I can VLAN tag the incoming traffic, then I can let the VLAN tags get the IPsec tunnel traffic to where it needs to go at its ultimate endpoint where it will be de-encapsulated and read. Internet traffic from 64.x.x.x in tunnel -> ASA outside interface 72.x.x.x -> ASA inside interface 0/1 vlan 10 with IP 192.168.1.1 255.255.255.0 -> L2 switch (trunked to ASA) -> VMware vSphere vSwitch (trunked to L2 switch) -> virtual machine host at 192.168.1.1 (web server) and then back out to internet. Internet traffic from 68.x.x.x -> ASA outside interface 72.x.x.x -> ASA inside interface 0/1 vlan 20 with IP 192.168.2.1 255.255.255.0 -> L2 switch (trunked to ASA) -> VMware vSphere vSwitch (trunked to L2 switch) -> virtual machine host at 192.168.2.1 (web server) and then back out to internet. I have done this successfully when employing IPsec tunnels between a remote Cisco ASA across the internet to another Cisco ASA in front of the infrastructure I mentioned above. However, I am not sure where to start when trying to do it with non-Cisco equipment. I only want to allow in the specific tunnels I have set up. In order to achieve the above, you must create a static NAT mapping in order to make the internal web server (192.168.1.1) visible on the internet. You must create a static NAT mapping between a public IP (let’s call it 72.1.1.1) and the private IP of the webserver (192.168.1.1). Then, the other site (non-Cisco device) must communicate with the public IP (72.1.1.1) for its IPSEC end-point peer. You must also configure an ACL applied on the outside interface of ASA in order to allow the IPSEC protocols to come in. These protocols are UDP 500, AH, ESP. I have a similar setup as your diagram above except the IP addresses and the Internal router. Instead of the internal router, i have a hp 2920 switch which acts as a L3 switch and does all the inter-vlan routing. Vlan1 subnet (192.168.100.0/24) is directly connected to the ASA’s inside interface 192.168.100.2. So devices on that vlan1 can go out to the internet fine. The second vlan104 subnet (192.168.104.0/24) cannot go out the ASA although I have the routes. Vlan104 can ping as far as the core switch (hp 2920). The 2x vlans can ping across each other fine. Sir, I desperately need assistance from you. THANK YOU!!! 1) Can you ping ASA inside (192.168.100.2) from vlan104 subnet? 2) allow all IP traffic on ACL “inside_access_in” to make sure its not an ACL blocking issue.